The word “Code System” at the top of the list represents the root of your system of codes (or hierarchical “Code Tree”). You can gradually build up a system of categories from this point. 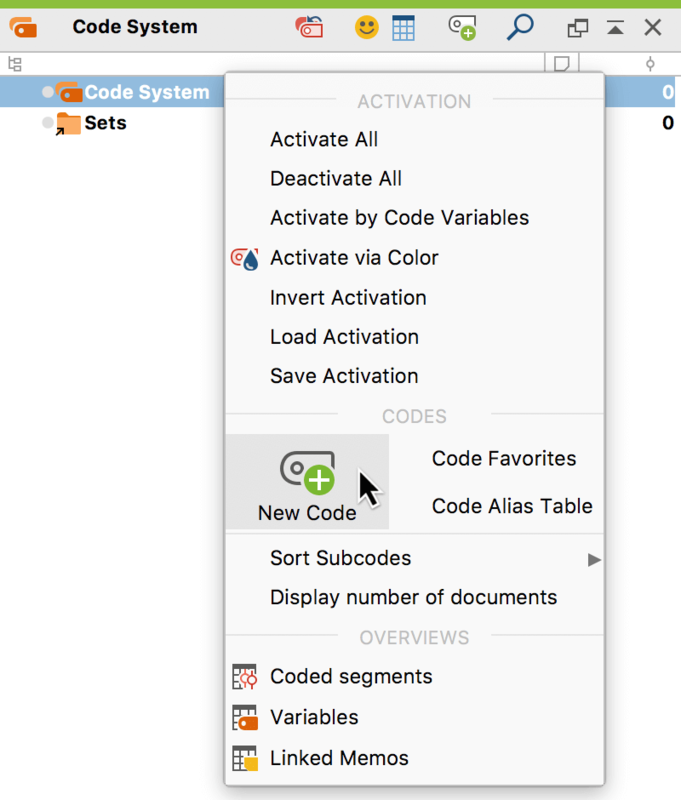 The easiest option is to click on the New code symbol in the “Code System” toolbar. Another option is to right-click on the Code System row and select New code from the menu that appears. The third option is to create a new code by using the keyboard shortcut Alt+N (Windows) or cmd+option+N (Mac). For this to work, however, the “Code System” window must be selected. Type the name of the new code in the upper dialog field of the window. You can select a color attribute for the new code below. 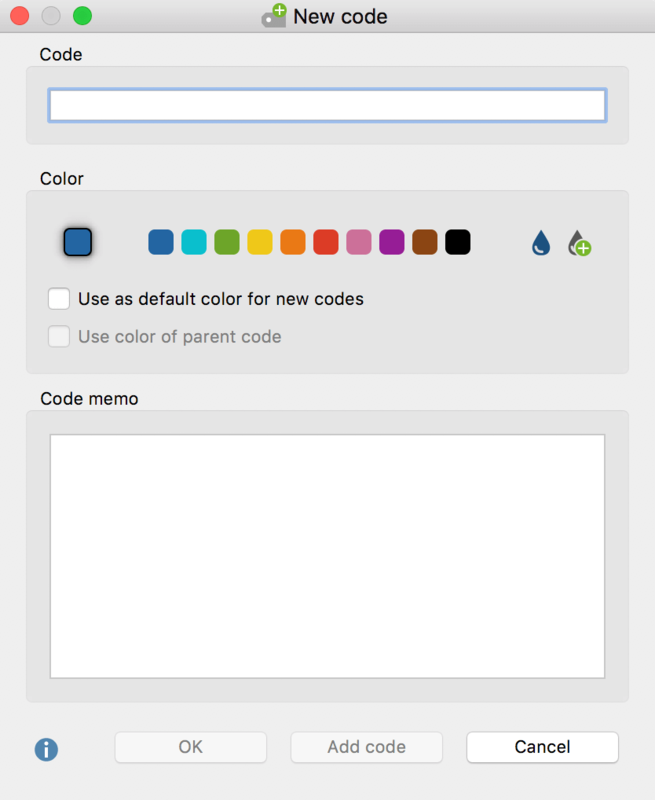 If you select the option Use as the default color for new codes, all newly created codes in the project will use this chosen Color. Of course, you can change this default color each time you create a new code using this dialog. Click OK to create the new code and close the window. If on the other hand, you click on Add Code, the window remains open and you can define further codes at the top level. If you would like to define subcodes, just right-click the parent code and choose the option New code. Again the same dialog window as mentioned above will pop up. If you want the subcode to have the same color attribute as the main code, just click the checkbox “Use Color of parent code”. Creating subcodes can also be completed using the Alt+N (Windows) or cmd+option+N (Mac) keyboard shortcut or the New code icon from the toolbar. It should, however, be noted that the code for which you wish to create a subcode should be highlighted in blue. If you have entered text into the memo field of the dialog box, a memo icon is displayed beside the new code in the “Code System” as soon as you close the dialog window. Please note: Newly-created codes are always added at the top of the “Code System” unless created as a subcode, in which case it will appear as the top subcode.